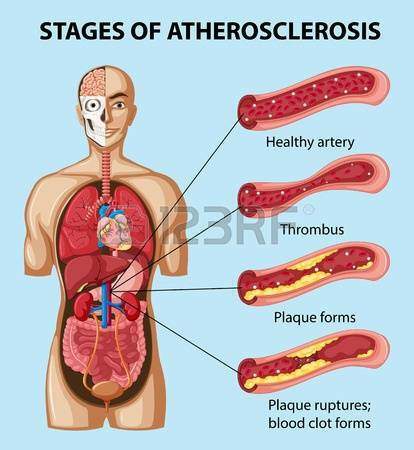 Stages of atherosclerosis in human. How marijuana may help. Hardening of the arteries or Arteriosclerosis occurs when vessels become rigid and thick. Arteries are damaged – through the aging process – or because of a metabolic disorder, where of the body fails to maintain integrity; substances such as calcium, proteins, lipids are deposited slowly throughout the circulatory system. Over time this disorder is often life threatening, however, the good news is that Atherosclerosis is preventable and treatable. How Can Marijuana Help in Atherosclerosis and Heart Disease? Cannabinoid receptors throughout the cardiovascular system play a major role in the regulation of heart function and circulation. Both the body’s own Cannabinoids and Hemp Cannabinoids are now known to be major regulators of circulatory and immune-inflammation system functions. Since inflammation is a large aspect of atherosclerosis, researchers have suggested that cannabinoids of Marijuana can counter the progression of this disease. Heart disease is the leading cause of death in America, claiming more lives than cancer. 75% of all cardiovascular related deaths result from atherosclerosis, a treatable disorder. Amiodarone Side Effects: Wheezing, cough, chest pain, coughing up blood, breathing problems that get worse; a new or a worsening irregular heartbeat pattern (fast, slow, or pounding heartbeats);a light-headed feeling, like you might pass out; blurred vision, vision loss, headache or pain behind your eyes, sometimes with vomiting; liver problems–nausea, upper stomach pain, itching, tired feeling, loss of appetite, dark urine, clay-colored stools, jaundice (yellowing of the skin or eyes); signs of overactive thyroid–weight loss, thinning hair, feeling too hot or too cold, increased sweating, irregular menstrual periods, swelling in your neck (goiter); or signs of underactive thyroid–extreme tired feeling, dry skin, joint pain or stiffness, muscle pain or weakness, hoarse voice, feeling more sensitive to cold temperatures, weight gain. “In addition, administering CBD shortly after a heart attack has been shown to reduce infarct size and myocardial inflammation, thus showing potential as a treatment for myocardial ischemia.” – Dr. Durst. MMJDOCTOR: Atherosclerosis patients can consult with our doctors if medical marijuana (medical cannabis or mmj) is a right treatment for your conditions. Schedule your appointment online today. A licensed medical cannabis doctors are evaluating mmj patients 7 days a week from 11 am to 7 pm.